Andrew is the Managing Partner of the Firm. He joined the firm on 1st August 1996 and became a partner on 1st January 1999. His expertise extends to Banking, Finance and Corporate M & A. He is the head of the firm's Banking and Finance Department and jointly heads the Commercial and Corporate Department. He has been involved in major Corporate and M&A transactions involving listed and unlisted companies. 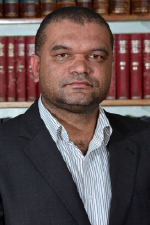 He also offers specialist services in labour, commercial and mining law and has recently been an adviser in important matters involving the banking sector.